NASA's Dawn spacecraft has zoomed in for a closer look mysterious geography of the dwarf planet Ceres. Since sliding to a height of 900 miles in mid-August, its vision has become three times sharper. 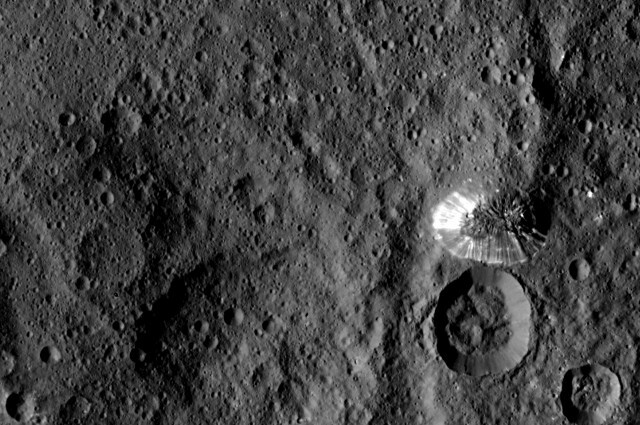 That has permitted researchers to zoom in on a 4-mile-high mountain in Ceres' southern hemisphere. The cone-shaped peak, which is nearly as tall as Mt. McKinley (the highest mountain in North America), has shimmering sides that are coated with some kind of reflective material, maybe ice. The mountain lies in a pretty flat region, and researchers aren't sure how it got there. Image credit: The lonely, pyramid-shape mountain in Ceres' southern hemisphere (glistening, middle right). NASA/JPL-Caltech/UCLA/MPS/DLR/IDA. Marc Rayman, Dawn's chief engineer and mission director, located at NASA's Jet Propulsion Laboratory, Pasadena, California said, in a statement "Dawn is performing flawlessly in this new orbit as it conducts its ambitious exploration. The spacecraft's view is now three times as sharp as in its previous mapping orbit, revealing exciting new details of this intriguing dwarf planet." Dawn will carry on examining Ceres in this new close-up sight until December, when it'll close in to 230 miles from Ceres' surface, which will optimistically help to shed some light on this and other oddly shimmering spots on the dwarf planets exterior.